The centerpiece of Norwegian Bliss' art collection is on the outside of the ship. 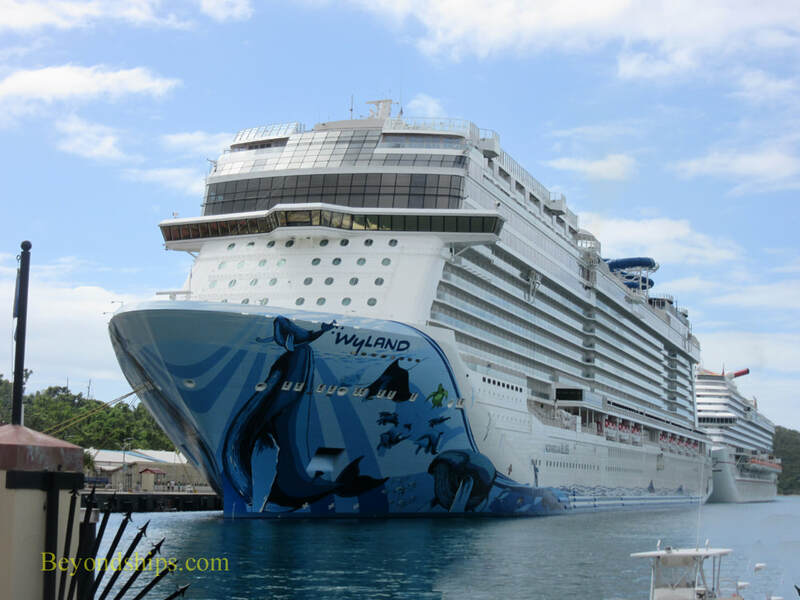 Norwegian Cruise Line has long had murals painted on the hulls of its ships. With Norwegian Breakaway, the line began having established artists create signed works for the hull art on each new ship. On Norwegian Bliss, the hull mural is called “Cruising with the Whales” and features life-size images of a humpback whale and her calf. It was created by marine artist Robert Wyland, known as Wyland. Wyland is a controversial artist but not for the usual reasons. Born in 1956 in Madison Heights, Michigan, he displayed an early aptitude for art. In junior high school, his art teachers suggested and held an exhibition of his works in the school lobby. At the same time, he was doing paintings and sculpture for friends and neighbors. After graduating from Detroit's Center for Creative Studies, he moved to Laguna Beach, California. Wyland had been to Laguna Beach before, During a trip to Laguna in 1971, Wyland had been impressed when he saw grey whales migrating along the coast. This led to an interest in marine life and conservation. The environmental movement was gaining momentum and Wyland decided to make marine conservation the primary focus of his art. To promote his art work, Wyland participated in art festivals and eventually opened his own gallery. His works sold and he opened more galleries. He traveled extensively painting monumental public murals. He entered into collaborations with corporations such as Disney. He also did several television series about art and the environment. His efforts at promotion were so succeeded that in 2017 the Los Angles Times estimted that he headed a $40 million business. Thus, Wyland's road to success was pretty much outside of the art establishment. Perhaps not surprisingly, some in the art establishment have refused to give him their seal of approval, writing him off as an inconsequential talent and an unrepentant self-promoter. However, the facts remain that thousands - - if not millions - - of people as well as major corporations find his work appealing and that his work has influenced many people both as to art and marine conservation. 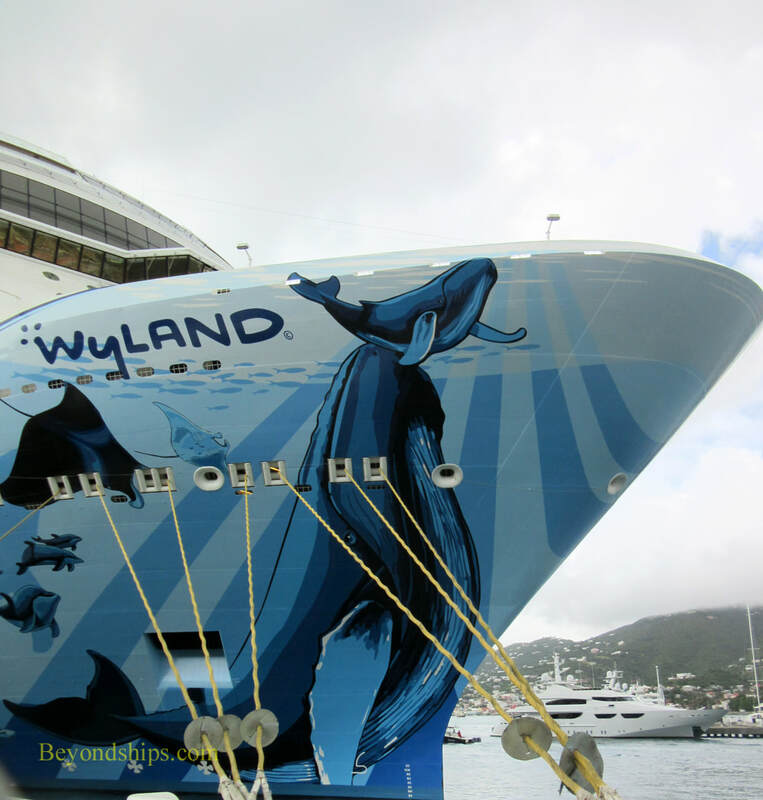 The mural on Norwegian Bliss, is not Wyland's first large scale depiction of a whale. Indeed, in 1981, he did his first whale mural in a parking lot Laguna Beach. From there, he successfully embarked on a goal of doing 100 monumental whale murals. The hull mural is not the only art on Bliss. 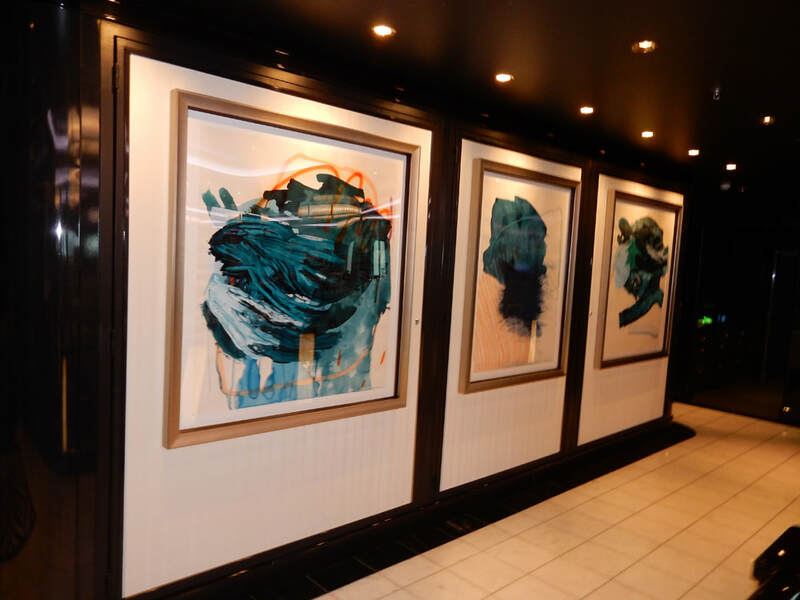 At one time, the art collections inside Norwegian Cruise Line ships were renowned. However, with changes in ownership and management, art became a low priority. Indeed, on some ships, it became hard to find art outside of the commercial art gallery, which is operated by a franchisee. But with Norwegian Bliss, there seems to be a renewed commitment to art. 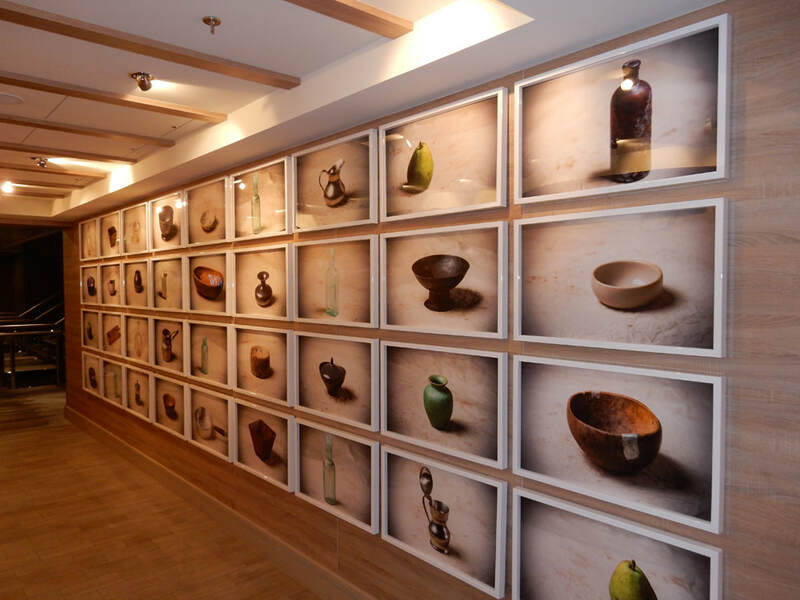 In the public areas and in the hallways around the cabins are a significant number of original works. Most are contemporary and the majority are abstract. However, as a whole, it is an interesting collection. It also has the effect of giving the interior of the ship a more elegant and luxurious atmosphere. Reportedly, Frank Del Rio, chairman of Norwegian Cruise Line Holdings, played a major role in the selection of the art for Norwegian Bliss. Our one complaint about the collection is that there is no signage giving the names of the artists or details about the works. We suggest that Norwegian follow the lead of Royal Caribbean, Holland America and Princess and provide such labels. ​Above and below: Wyland's hull mural "Cruising With the Whales." Above and below: ​The Norwegian Bliss collection enhances the atmosphere of the ship giving it a more elegant and luxurious feel.